The choices of fabrics, textures, and opacity are unlimited. All offer varying degrees of light control and privacy. With the vast array of fabrics and materials to choose from, there is a window shade to suit almost any room in the home. The privacy and light control needs of the room will dictate which of the many fabrics you can choose from. The more sheer fabric can filter light and the opaque can darken the room. Fabric texture options with window shades can accommodate formal looks to casual looks and anything in between, making these products popular for any room and its decor. 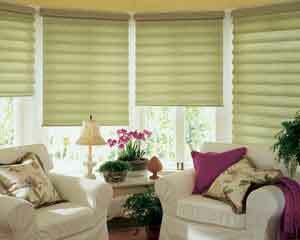 Honeycomb shades get the name “honeycomb” due to their construction, which is designed like a honeycomb in a beehive. They are made of soft textured, woven and non-woven fabrics with crisp, even pleats. Many shades are available in single, double and triple honeycomb designs, a variety of pleat sizes which provide varying degrees of light control and privacy. Woven wood shades are made up of bamboo, reeds, grasses, and jutes adding warmth and dimension to a room. 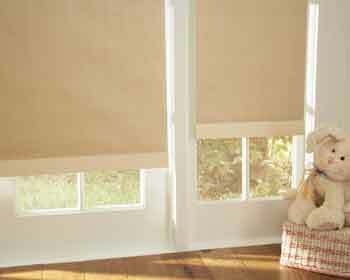 These shades are well suited in a casual setting, like a family room or den. In a contemporary or tropically influenced design, these shades work well in any room. A vast improvement to the traditional roller shade, window shades come in hundreds of fabrics, colors, and styles and you can order select fabrics separately for designing room accessories.